I joined the Open University as a Lecturer in Literature in 2001. I'd taught previously at King’s College London, the University of Roehampton, and the University of Chester, where I also completed my Postgraduate Certificate in Teaching and Learning in Higher Education. My first degree, in English Language and Literature, and my MA in Victorian Literature were awarded by the University of Liverpool. During my MA studies in Liverpool I was employed as a Research Assistant working on editions of Percy Bysshe Shelley's and Matthew Arnold's poetry - my first taste of scholarly editing. The British Academy funded my PhD research at King's College, London, which was awarded in 1997 following a viva examination with Professors Bernard Bergonzi and Philip Horne. I have written teaching material for all levels of study, worked as Chair and Deputy Chair of modules in production and presentation, and served as Director of Research Degrees in the Faculty. I have produced OpenLearn material and acted as the OU's academic consultant to the BBC. As critic, and as editor, my research on Ford Madox Ford is internationally known, and I am Chair of the Ford Madox Ford Society, as well as a member of the History of the Book and Reading (HOBAR) Research Collaboration at the OU. As a teacher and as a researcher I am passionate about what I do because I believe in literature as a force for good, as an agent of change, as well as an education, a distraction, and a delight. There are three inter-related strands to my research profile: the work of Ford Madox Ford, scholarly editing, and the literature of the First World War. 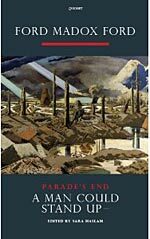 In Ford studies, I was part of the team which produced the first critical edition of Ford's First World War tetralogy Parade’s End (1924-28), published by Carcanet Press in 2010-11. I edited volume 3, A Man Could Stand Up-. Filming of the BBC/HBO serialisation of Parade’s End (dir.Susanna White), which was scripted by Tom Stoppard, began in 2011, and a high point of that year was a visit to the set. Further related editing projects include Ford’s classic modernist text, The Good Soldier. Here you can read my introduction. Currently, I am co-editing the Routledge Research Companion to Ford Madox Ford, a work which will help to shape the research agenda in this field for a new generation of scholars, and I am a member of the Editorial Board of International Ford Madox Ford Studies, which in 2015 took the form of a volume of essays celebrating the centenary of The Good Soldier's publication, a volume which I co-edited. 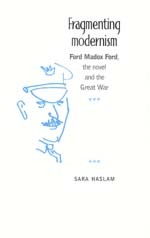 My monograph on Ford, Fragmenting Modernism: Ford Madox Ford, the Novel and the Great War (2002) was re-released by Manchester University Press as part of its OAPEN project in 2008. My work as an editor is currently focused on Evelyn Waugh, as part of Oxford University Press's project: The Complete Works of Evelyn Waugh. I am editing Helena, about the mother of Emperor Constantine, which Waugh described as a favourite among his novels - the Daily Express agreed with him, calling it his 'best novel yet' (12 October 1950). Nineteenth and twentieth-century cultural, social and political issues are at the heart of my research. I have written on Ford’s treatment of railway pathologies, for example, and of sexuality, as well as on his representations of the experience of war. My publications also include articles and book chapters on Thomas Hardy, Henry James, the Brontës, Joseph Conrad, and life writing. 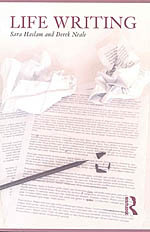 I peer review for a number of journals and academic and trade publishers, and the AHRC's Peer Review College. I was interested in distance learning methodologies before joining the Open University, and in 2000 produced a CD-ROM on the poetry of Thomas Hardy – follow the link for a taster. This CD-ROM includes the Complete Poems and numerous audio and video extracts. Now my teaching commitments include A335 Literature in Transition, for which I have written teaching material on Ford's The Good Soldier; and A230 Reading and Studying Literature, where my teaching units focused on James Joyce's collection of short stories, Dubliners. 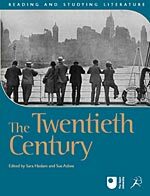 I co-edited The Twentieth Century, pictured above left, for Bloomsbury while A230 was in production and was also deputy module team chair. 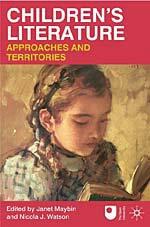 I have also written teaching material for other current and recent modules across all levels of the curriculum, including A215 Creative Writing; A150 Voices and Texts; EA300 Children’s Literature, and A300 Twentieth-Century Literature: Texts and Debates. I was Chair of the Start Writing suite of modules, including Start Writing Fiction (A174), and Start Writing Poetry (A175) from 2008-2012 and wrote teaching material for Start Writing Essays (A172). While serving as Director of Research Degrees in the Faculty (2012-14) I wrote teaching material supporting the progress of our PhD students, and I have designed and led PGRS training and development events for the department or the Faculty annually since 2009. My current major teaching role is as Chair of the Access Module in Arts and Languages (Y031), the theme of which is Popular Protest. I am relishing the opportunity to work at this level of study, developing materials to ensure students begin their degrees fully equipped for study. I'm currently working with colleagues from several disciplines on a new introductory asset for the module, on the protest banner in history. Recent and current research students have undertaken PhDs on Virginia Woolf, Joseph Conrad, Thomas Hardy, Edith Wharton, and the literature of the First World War. Informal PhD enquiries are welcomed, but please also refer to the Postgraduate section of our departmental website for further relevant information. I was an academic consultant and an interviewee for the Culture Show Special, ‘Who on Earth was Ford Madox Ford?’ (BBC2, 1 September, 2012). At an open session of the Parade’s End conference, held in London in Sept 2012, I chaired a question-and-answer session with Susanna White, director of the Parade’s End adaptation, and Rupert Edwards, producer of the Culture Show Special. 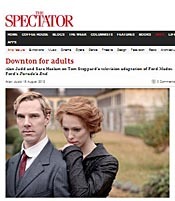 I was also the academic consultant for a second Ford-related BBC project, ‘The World of Parade’s End’ (BBC2, 24 August, 2012), and co-authored a magazine article in the Spectator on the BBC/HBO adaptation (18 August, 2012). I delivered a talk on Ford Madox Ford as part of the South Bank ‘The Rest is Noise’ Festival on 3 February 2013, and a public lecture on Ford at Stony Stratford library on 19 March 2013. In September, 2015 I gave the keynote lecture at a conference on Ford and H.G. Wells's war writing. Guardian journalist Sam Jordison joined us for the event and I interviewed him about his book project on Wells, as well as his experience of running an online reading group on Ford's novel. In 2016, my major external engagement was with the BBC, in my role as academic consultant for the OU on Sally Wainwright's new drama, To Walk Invisible, which is about the life and work of the Brontë sisters. A documentary film on Ford’s life and work for which I was interviewed, It Was the Nightingale: the Unreliable Story of Ford Madox Ford, dir. Paul Lewis at Subterracon Films, had its official launch in 2017 at an event at the London Review Bookshop, sponsored by the Open University. I have shown the film at local schools and colleges, contributing to their curriculum and widening knowledge of Ford and his work. 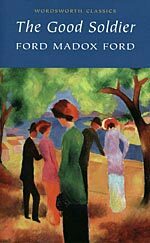 I was an Editorial Board member of International Ford Madox Ford Studies to 2015, and am now part of the project team developing the new Ford Madox Ford Journal, to launch in 2018. My external research networks include the Medical History of the First World War network and WAR-Net, an interdisciplinary network for scholars working on war representation. The Ford Madox Ford Society holds an annual conference, has a North American chapter, and fosters many of my research links and collaborations. I have worked in European research networks, including COTEPRA. I work closely with academics in France, Italy and North America in the area of Ford Studies. Ford's papers are held in Ithaca, New York, and New York City, and much of my current work on the women who powered First World War bibliotherapy is founded on links with institutions and academics in the United States. I have received a 5k BA/Leverhulme Small Grant for my research project: ‘The Bridge to Joyceland and Beyond: Ford Madox Ford in the Twenty-First Century’ which will involve archival work at two libraries in the US. Cornell University houses the most significant collection of Ford’s manuscripts and papers, and there I will be accessing materials related to his early life and work as I prepare a proposal for a volume of his fairy tales and develop a database of his letters. During a second trip, to the New York Public Library, I will document Ford’s final book collection, donated to the library in the 1990s. Considering how well-connected Ford was in the 1920s and 1930s, I shall be looking for significant dedications as well as marginalia as I prepare an essay on the collection for the inaugural issue of the new Ford Society Journal. Haslam, Sara; Colombino, Laura and O'Malley, Seamus eds. Saunders, Max and Haslam, Sara eds. Haslam, Sara and Asbee, Sue eds. Haslam, Sara and O'Malley, Seamus eds.